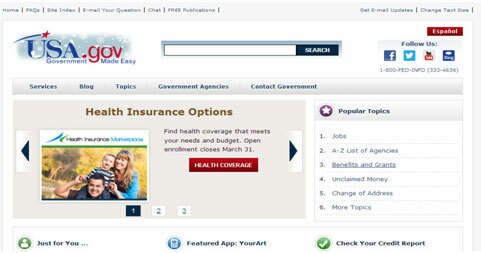 USA.gov, is the official government website to find government information and services on the internet. Government services are indexed A-Z, including “Health Insurance,” “Passports,” or “Unclaimed Money from the Government.” You can also browse Government services that are indexed by topic or subject areas. An example of this would be the subject entitled “Benefits and Grants: Online Services” which includes information on housing assistance, government grants, veteran benefits and much more. Government agencies are alphabetically listed as well; in this section you will also find links for state and local government representatives, local agencies and the proper contact info. There is a tab for the section called Blog, which covers current events which could include comments about weather patterns or sometimes warnings about scams. This is also the site to get Free Government publications on a wide variety of topics including Going Green, Pet Care, or Nutrition. This is a great site for all kinds of Government Information….bookmark it today! Next → Next post: New Year, New You!